a) By reading English newspapers. b) By reading different English books. d) By listening to English news of different TV channels including CNN and BBC. e) By watching English movies. f) By writing new words in a diary. 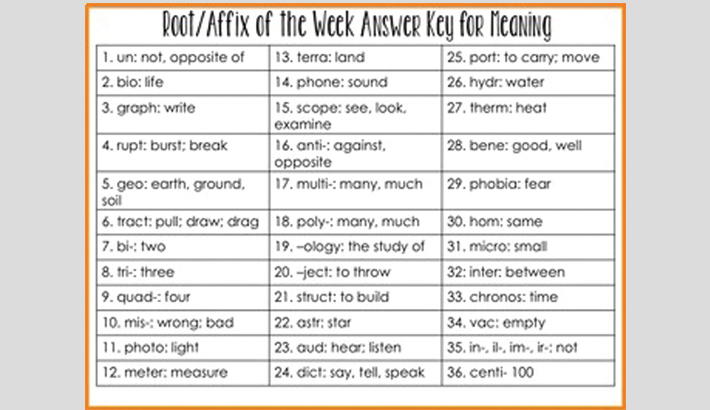 We can also enrich vocabulary by learning affixes (Prefixes and suffixes). It is one of the best ways of improving vocabulary. Prefix: In case of prefix, we add a group of words to the beginning of a word to make a new word by changing its meaning. Suffix: we add a letter or letters to the end of a word to form a new word. Sometimes, we add prefix, sometimes suffix and sometimes both prefixes and suffixes to the root word with a view to making new words. From known words, we can make many unknown words by adding prefix and suffix. So, it is a must to teach prefix, suffix in an effective manner to enrich students’ vocabulary. If we teach vocabulary in isolation, it will bring no good outcome. So at the time of teaching new vocabulary, we should show the ways of using the new words in different situations. The students should also be apprised of the meaning of the new words. Besides, it is imperative to know the class or parts of speech of the new words formed by adding prefixes and suffixes. Suppose, ‘prison’ is a word from which we can form new words like ‘prisoner’, ‘imprison’ and ‘imprisonment’. If we do not use them in a sentence, our efforts may be futile. My today’s discussion focuses on how we can enrich students’ vocabulary through adding prefixes and suffixes identifying the class of the words using them in different situations. I would like to explain the above three words derived from ‘prison’. Prisoner- It is a noun, meaning a person who is kept in a prison as a punishment for any crime. Use: A prisoner has little scope to come out of the prison. Imprison- It is a verb meaning to put someone in a prison from which they can’t escape. Use: He was imprisoned for committingrobbery. Imprisonment- It is a noun meaning the state of being in a prison. Use: The man was sentenced to life imprisonment for murder. ‘Sure’ is an adjective from which we can make ‘ensure’ by adding prefix like ‘en’ and ‘surely’ by adding suffix like ‘ly’. Ensure- is a verb which means to make sure that something will happen. Use: The new law will ensure safety on the roads. Surely: It is an adverb meaning ‘certainly’. Use: He will surely pass the exam. From known words, we can make many new words in this way. We can make new words by adding suffixes like ‘er’ or ‘or’ to the base forms of most of the verbs to turn them into common nouns. Write- Writer: It means someone who writes books, stories. Use: Humayun Ahmed was a great writer. Rule- Ruler: It means a person who rules or governs. Use: He was a good ruler. Examine- Examiner: It means a person who looks over answer papers or tests students’ ability. Use: An examiner must be sincere. Sell- Seller: It means a person selling something. Use: Sellers are very cunning. Invent- Inventor: Meaning someone whose job is to invent something. Use: Marconi was the inventor of radio. Conquer: Conqueror: Means a person who conquers. Use: Alexander, the Great, was the conqueror ofmany battles. Decorate- Decorator: Meaning a person who paints or decorates a house. Use: The decorator decorated the house nicely. The verbs which end with the suffix ‘fy’ take ‘ier’ in place of ‘fy’ to form nouns. 1. Purify-Purifier: meaning a device that removes substances that are dirty. 2. Beautify- Beautifier: means a person or a thing which beautifies or makes beautiful. 3. Classify- Classifier: Means a person or thing that classifies. Similarly, we can make ‘rectifier’ from ‘Rectify’, ‘verifier’ from ‘verify’ etc. 1. Pure: Meaning not mixed with anything else. Use: We should drink pure water. Purity: Meaning the state of being pure. Use: We must ensure the purity of drinking water. Purification: Meaning the act of purifying something. Use: They have made a water purification plant. Purely: Meaning completely and only. Use: He is purely an honest man. Use: I like classical music. Classification: Meaning the process of putting people or things into a group or class. Use: Do you know the classification of adverb? use: He is a classically trained singer. 3. Beautiful: It means nice. use: The garden looks beautiful. Beauty: Meaning a quality that a place or person has that makes them very attractive. Use: The beauty of the Tajmahal attracts all. Beautification: Meaning the process of making visual improvement to a person, place or thing. Use The beautification process of the town is going on. Beautifully: Meaning very well or excellently. Use: We decorated the house beautifully. Besides, many adjectives take suffix like ‘en’ to make verbs. Examples: Black- blacken, Bright- brighten, Tight-tighten, Deep-deepen etc. On the other hand, many adjectives and nouns take the prefix ‘en’ to make verbs. Example: Rich- enrich, able- enable, noble- ennoble, danger- endanger etc. So, this important grammar item should be taught explaining every new word with their meanings and usage. The writer is an Assistant teacher, SaberaSobhan Govt. Girls’ High School, Brahmanbaria.